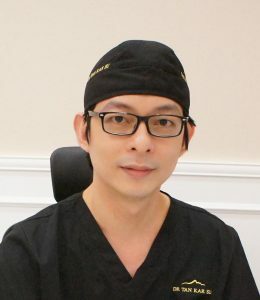 Dr Tan is a registered ENT practitioner subspecializing in the field of Facial Plastics Surgery. After completing his ENT training, he spent 1 year full time in Shimmian Rhinoplasty Clinic in Seoul, South Korea. Shimmian Rhinoplasty Clinic is a high volume rhinoplasty specialist centre. During his time there, Dr Tan performed several hundreds of rhinoplasties and facial bone surgeries on Korean and International patients. Upon his return, Dr Tan served as a Consultant in the Facial Plastics Service of Khoo Teck Puat Hospital ENT Department, serving mainly patients in need of rhinoplasties for breathing and cosmetic problems. Dr Tan decided to leave KTPH to start The Rhinoplasty Clinic to devote more time and energy and to focus more on his passion that is Rhinoplasty. Dr Tan Kar Su’s years of experience performing rhinoplasty in Korea and Singapore enabled him to appreciate the strengths and weaknesses of Oriental and Caucasian Rhinoplasty. Both schools have their distinct philosophies and techniques, but more significantly, weaknesses and limitations. This overview enabled Dr Tan to combine and employ a hybrid of techniques from both schools for maximum control of the nasal form and function. He regularly keeps his repertoire of rhinoplasty techniques up to date with the latest advances at international masterclass rhinoplasty conferences and symposiums to ensure his patients receive only the best. Coupled with his fixation with proper post operative care, Dr Tan aims to make rhinoplasty a predictable, safe and satisfying journey for his patients. Dr Tan advocates using autologous (from own body) materials in rhinoplasties as he believes this is the safer, more natural and lasting option. He also feels the nose is not just about looking good, but functionally it has to perform well too. In this respect, his foundation in ENT gives him valuable insights to retaining or improving the functional aspect of the nose when he performs his rhinoplasties. Dr Tan owes his deep gratitude to his mentors in NUS, the Singapore ENT and Facial Plastics fraternity and Shimmian Rhinoplasty Clinic, in particular, Professor Jung Dong Hak, Professor Han Seong Yik, Professor Chang Geun Uek and Professor Choi Woong Chul. He is ever grateful to these giants of their respective specialties for opening his eyes to new perspectives that cannot be easily taught in textbooks and lectures. In addition to holding his position as the Medical Director of The Rhinoplasty Clinic, Dr Tan is also Visiting Consultant to Khoo Teck Puat Hospital, Changi General Hospital and Ng Teng Fong General Hospital. Dr Tan is fluent in English, Mandarin and Korean.